According to Rich Davis this is unique in that Tulip only showed up in the Ty catalogue as what we know today as Shelby. Prince, the little frog, designed by Anne Nickels has also been found with the rare "Tulip" tag. 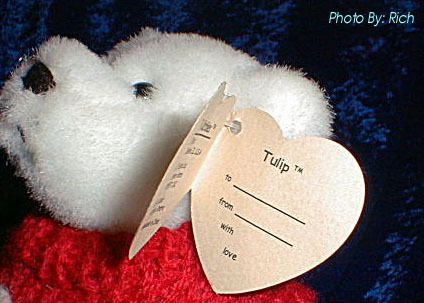 A special thanks to Lori Greenbeck for sharing her Nicholas with "Tulip" tag with us.